Two solid options. Both sold out but alternatives here and here. FYI the UNIFs are supremely comfortable. they are both so awesome! sad that they are sold out, hope u can get them somewhere else! I vote yes to the left. DO iiiiiiiiiiiit! ooomg I loveee the UNIF 's !! I have the unif flats except with silver spikes. They are so comfortable! I have the UNIFs except with silver spikes. I love them! BUT WHERE?? Where to get the gold spiked UNIFs?? I am desperate for those. The gold one is more powerful! Silver one is more light! Ohh so Saaad! Bu I think one you, it would good because, you get white skin!!! Dark is better with gold! Any shoe with a creeper intention makes my heart go pitter patter. gosh dangit i want those unifs so damn bad. I got the gold UNIFs from my husband as a belated Christmas gift. And they are absolutely amazing and ridiculously comfortable. 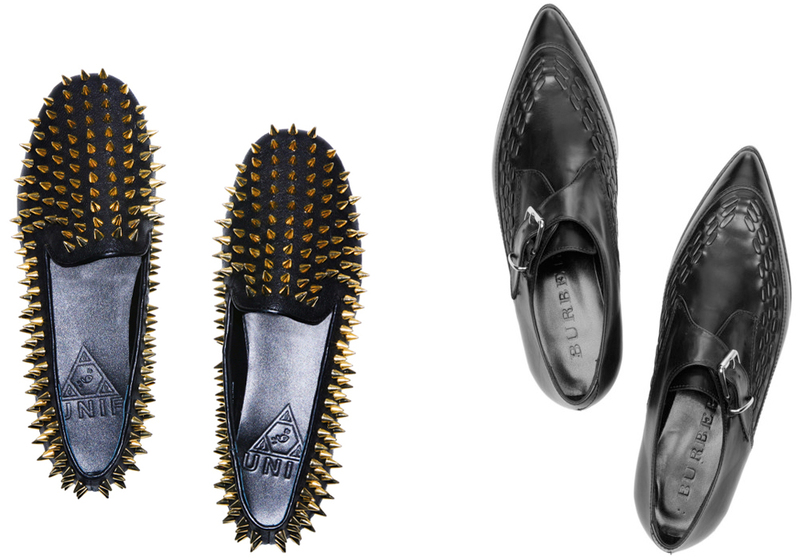 I've been looking for studded loafers for some time now. Great alternatives!